As you’re filling up your holiday wish list this year, forget the tablet or high-tech headphones — why not do something truly for yourself, instead? We’re all feeling a little wiped out after the crazy, whirlwind year that was 2017. Fortunately, Botox in Ft. Collins can rejuvenate your facial tissue to help you look bright, rejuvenated, and ready for everything that the new year has to offer! Our office is pleased to offer Botox alongside our comprehensive dental treatments. Keep reading to learn how this cosmetic treatment works, and why it could be the best thing you ever did for yourself! Botox is an injectable substance that can be used to treat a variety of muscular conditions and also smooth out fine lines and wrinkles in the facial tissue. It is currently the most popular non-invasive cosmetic treatment, with more than 6 million treatments performed each year (according to Medical News Today). Injected beneath the skin in miniscule amounts, Botox works by paralyzing the muscles beneath the skin that cause wrinkles when they contract. Botox has both cosmetic and therapeutic applications. Botox can be used to prevent jaw clenching that causes pain in the TMJ, or the temporomandibular joint, too. It is also the only FDA-approved preventive treatment for migraines. Botox for cosmetic treatment is completed so quickly and efficiently that some people come into the office before work or on their lunch break for a quick treatment. Your cosmetic dentist will carefully evaluate the area being targeted and then place the Botox injections strategically throughout the facial tissue. Even though it is administered with a needle, Botox does not cause much discomfort at all. Most people compare it to a brief pin prick. The effects of Botox should be visible within 3 to 4 days after application, and can last anywhere from 3 to 6 months before a reapplication is recommended. If you are interested in getting more youthful, radiant facial skin — and who isn’t? — then make this holiday season the time you achieve it! 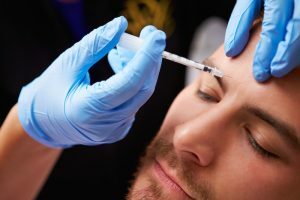 Botox can smooth out horizontal lines in the forehead, crow’s feet, and many other fine lines and wrinkles that make you look older than you feel. Don’t wait to get in touch with your cosmetic dentist in Ft. Collins to look your very best this month and going into the new year! You deserve it. Dr. Shiloh Lindsey is the Ft. Collins dentist providing comprehensive dental services, including Botox for cosmetic treatment and TMJ. If you are busy searching for a “dentist near me” to visit before the year’s end, don’t wait to get in touch with Aspen Dental Care! Contact the office today at 970-482-3166.